This exterior door has seven panels, three of which are lites (which is the name given to a glass panel in a door). The top lite is a horizontal rectangle and sits above the other two lites, which are vertical with scalloped top arches. The arched lites tie the entry way of the home to the arched brick entry way of the front porch. All the lites, as well as the two long windows flanking the door, have textured glass which afford more privacy and security than regular glass. The door's mid rail features a stainless steel mail slot. Beneath the mid-rail, the remaining four rectangular panels of the same size are arranged in a rectangle. 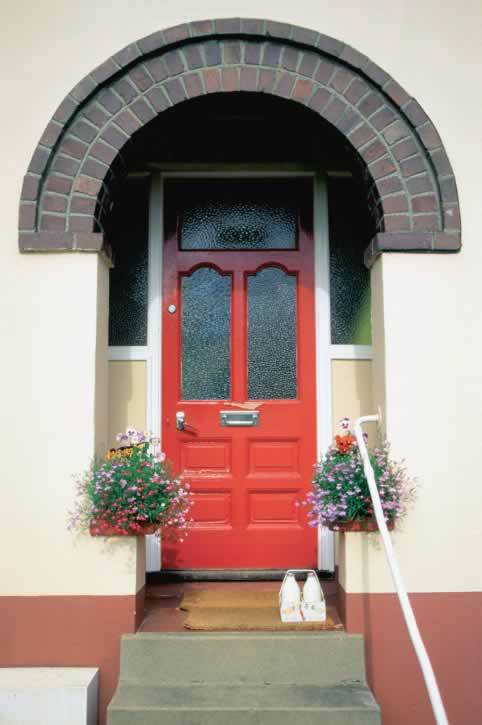 The door has been finished in a red enamel with a stainless steel door lever and lock. The lintel, door jambs, and windows have been finished with white trim.